Newly renovated, this gorgeous 2 bedroom, 2 bath villa is professionally decorated and offers stunning lagoon views as well as views of the 10th and 16th holes of the world famous Harbour Town Golf Links. The spacious and open floor plan upgrades include tile and hardwood floors throughout, a gourmet kitchen with stainless steel appliances, tile backsplash, and a granite counter with seating for 6. Access your private deck off the living room. 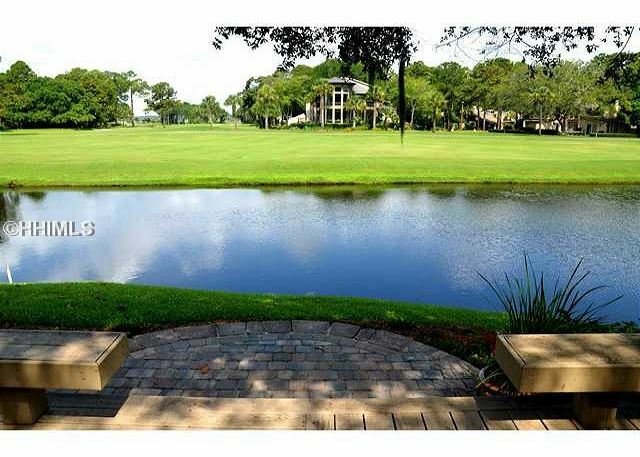 This is the perfect spot for al fresco dining and watching the golfers! Also located on this floor is a bedroom with queen bedding which accesses the hall bath. Upstairs on the second floor is the master suite with king bedding and en-suite bath. This bedroom also accesses a private balcony. This spectacular villa has it all; top of the line upgrades, beautiful views, and beautiful décor. As an end unit, this gorgeous villa offers the utmost in privacy and style.